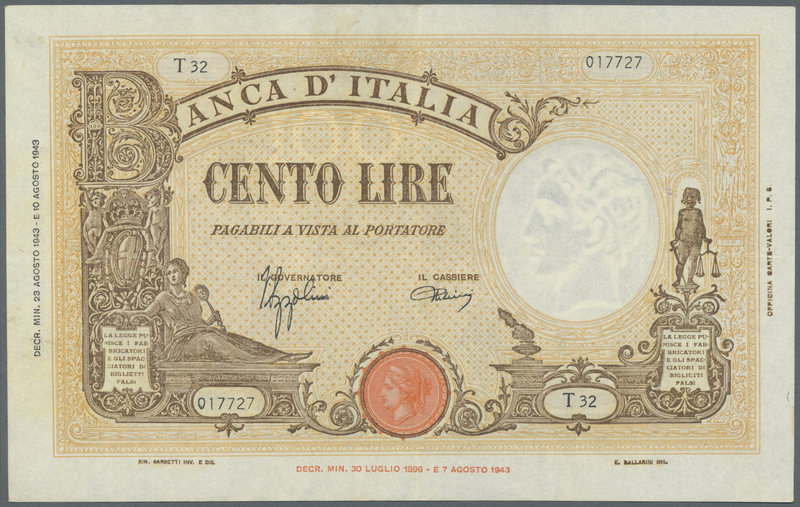 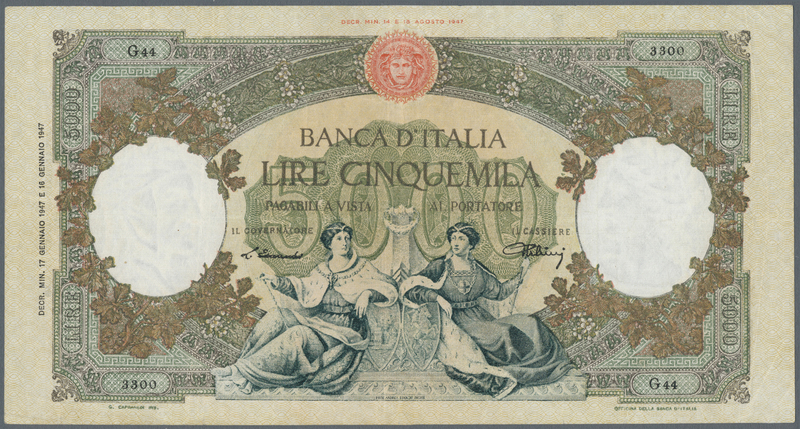 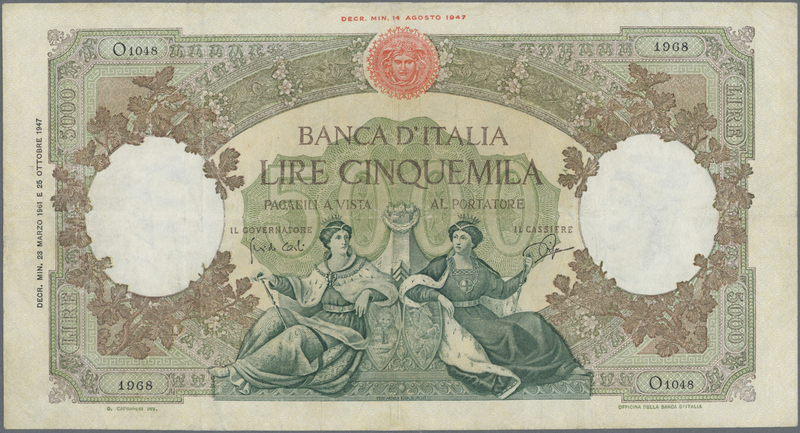 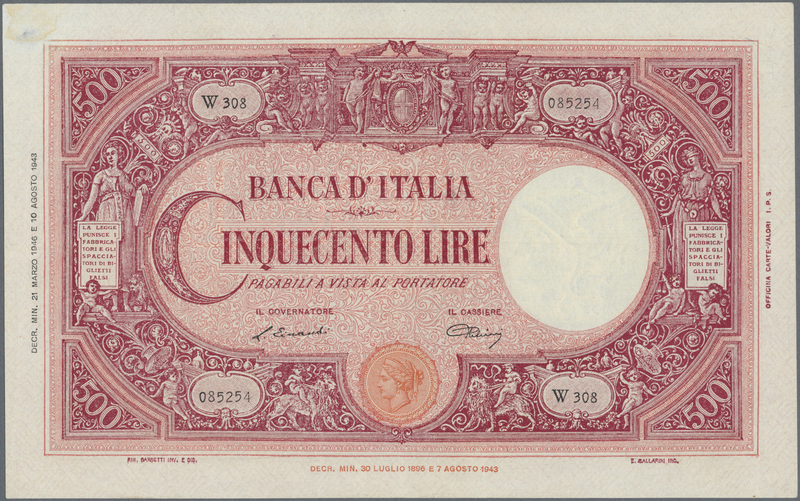 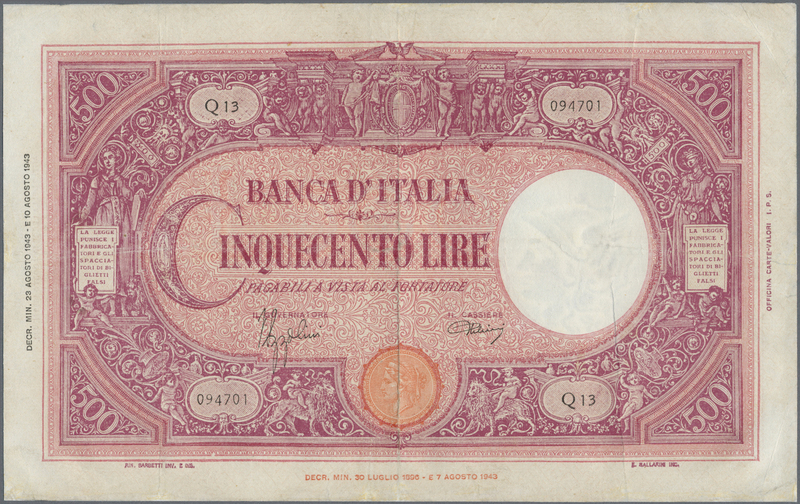 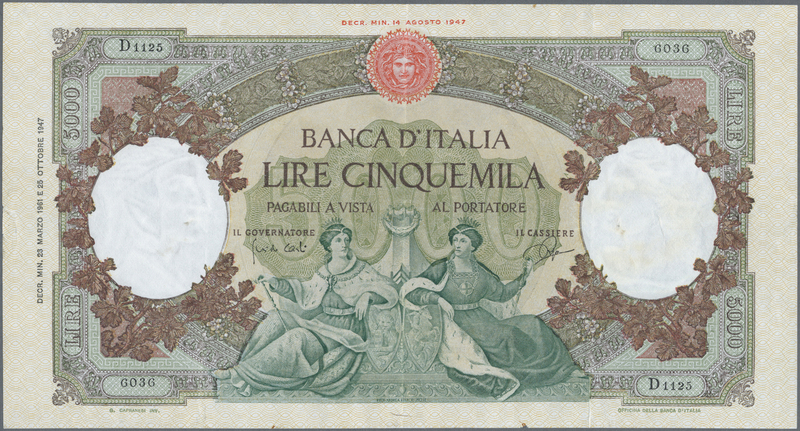 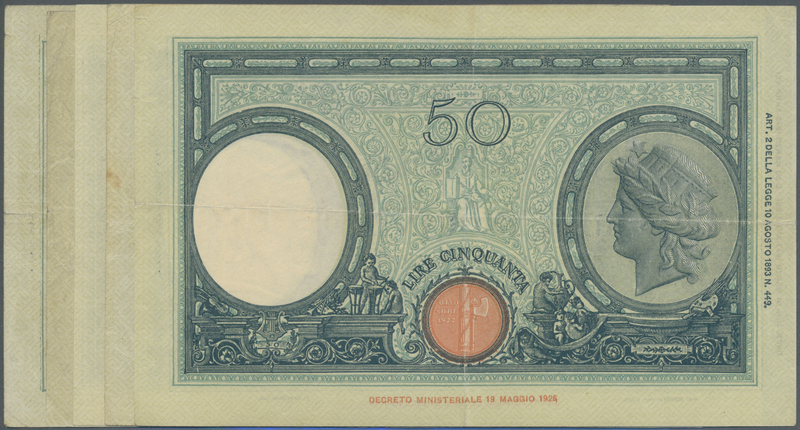 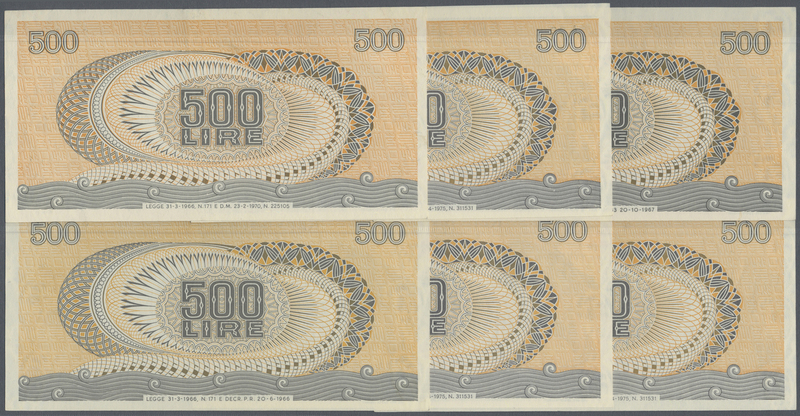 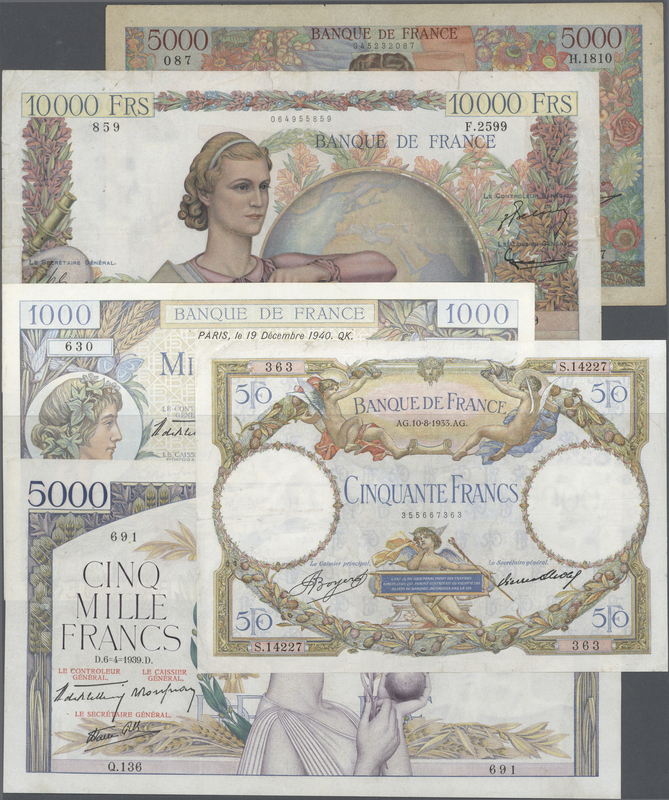 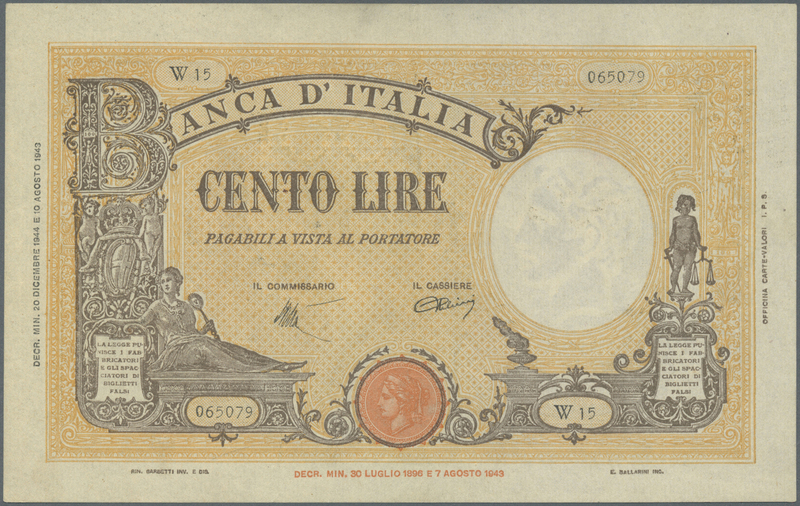 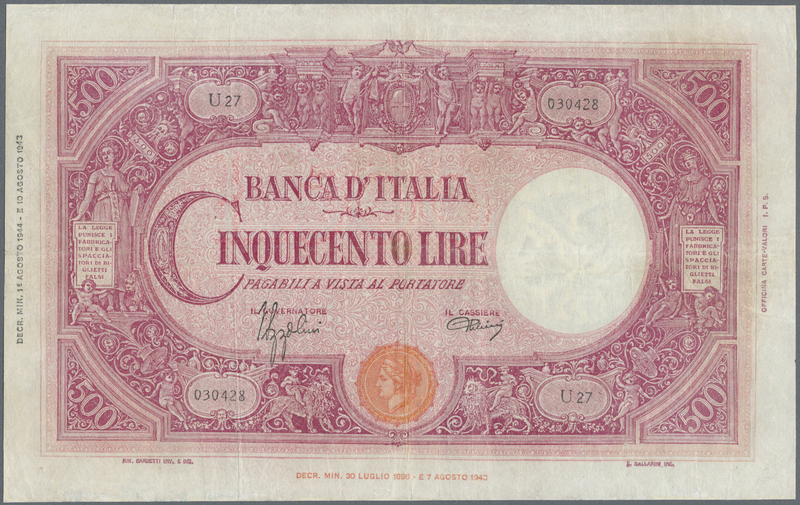 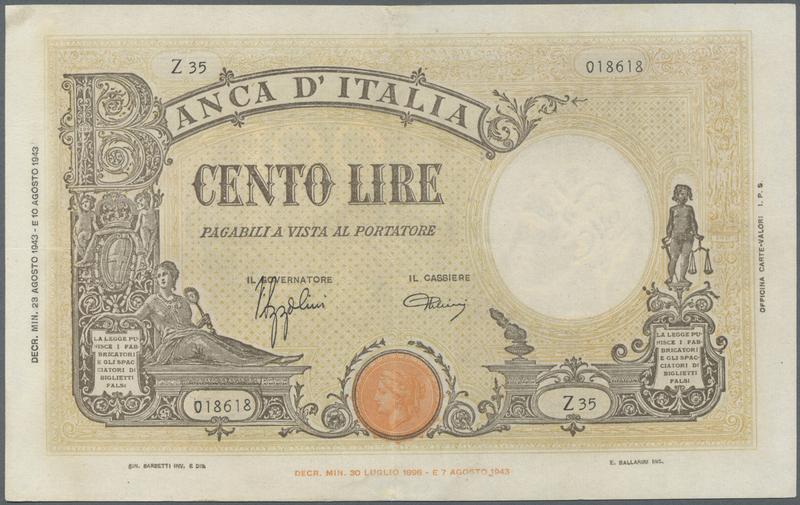 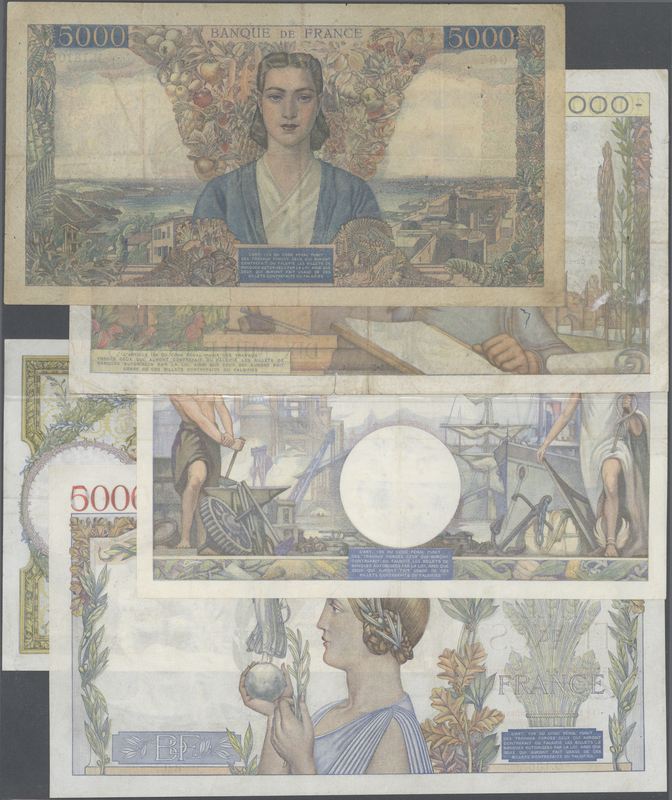 1832 Pick 69 500 Lire 1943 P. 69, one light center fold, no holes or tears, not washed or pressed, no repairs, original crispness in paper as well as original colors, nice large size note with classic design, condition: XF to XF+. 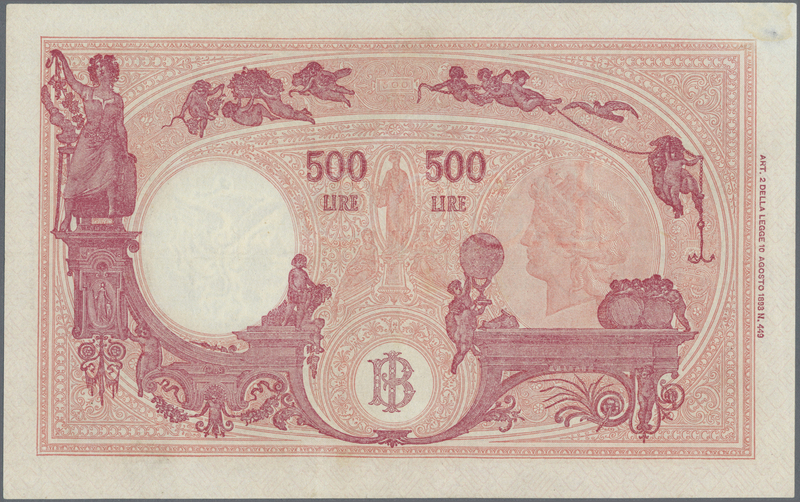 1837 Pick 80b 500 Lire 1961 P. 80b, crisp original paper, not washed or pressed, nice embossing of the print visible, one light vertical bend, no holes or tears, original fresh colors, condition: XF+ to aUNC. 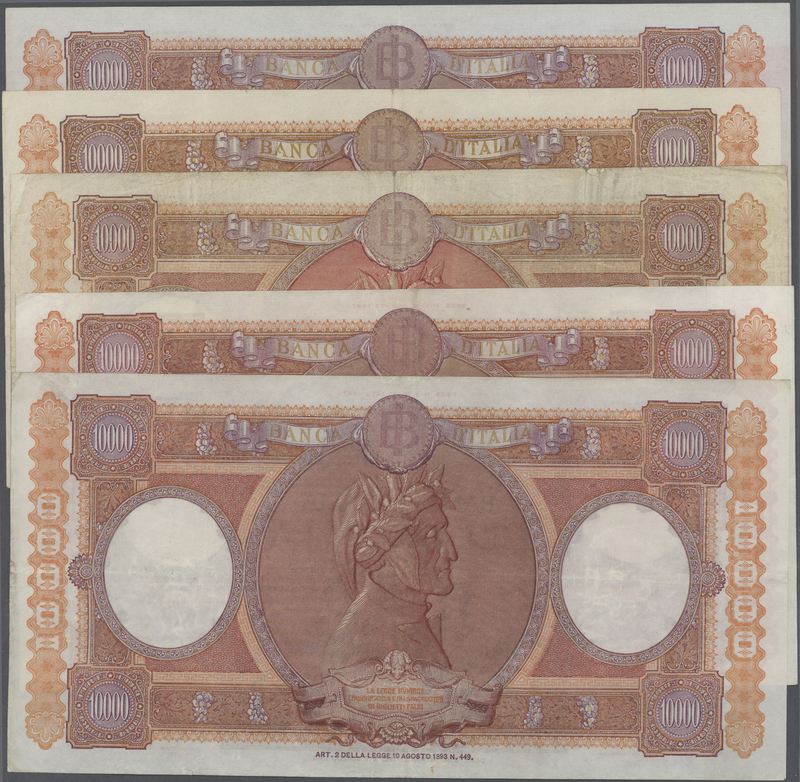 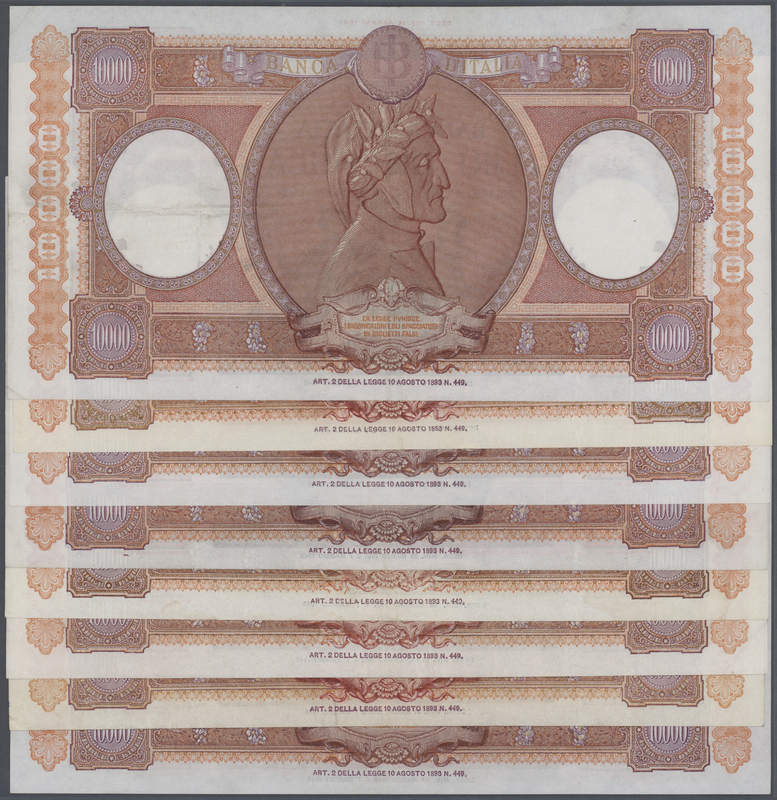 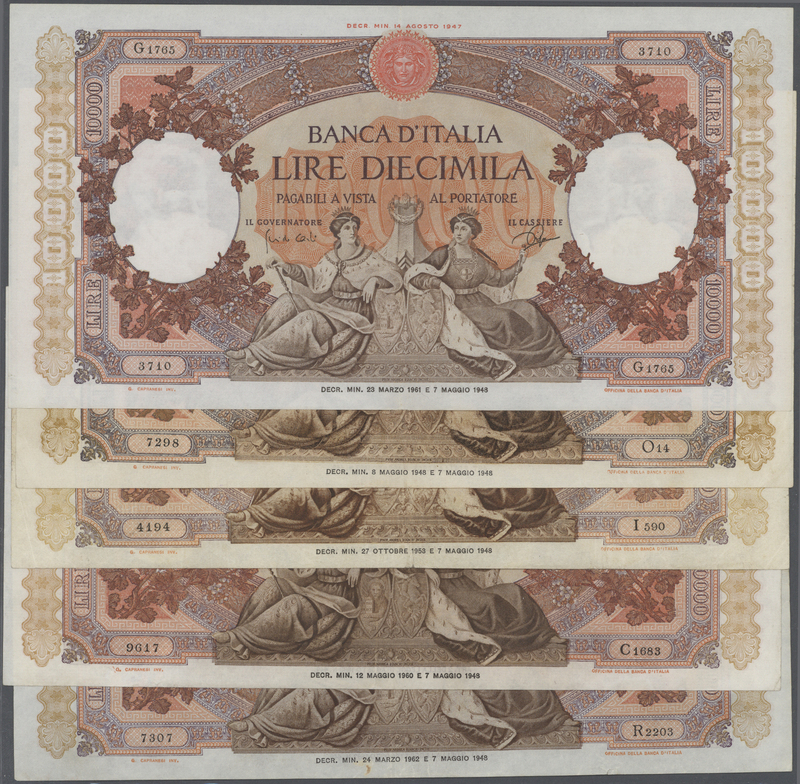 1838 Pick 82, 83 set of 6 notes containing 2x 1000 Lire 1943 P. 82 and 4x 1000 Lire 1947 P. 83, all notes without strong traces of use but all pressed, still strong paper, no holes or tears, nice colors, condition: VF to XF pressed. 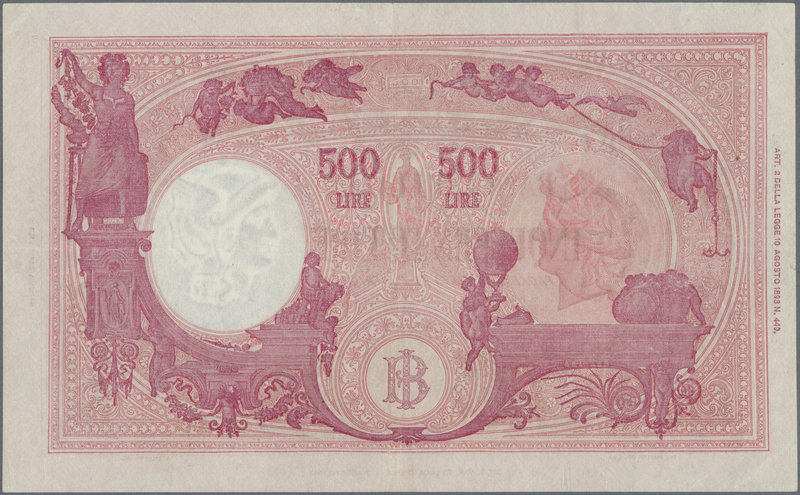 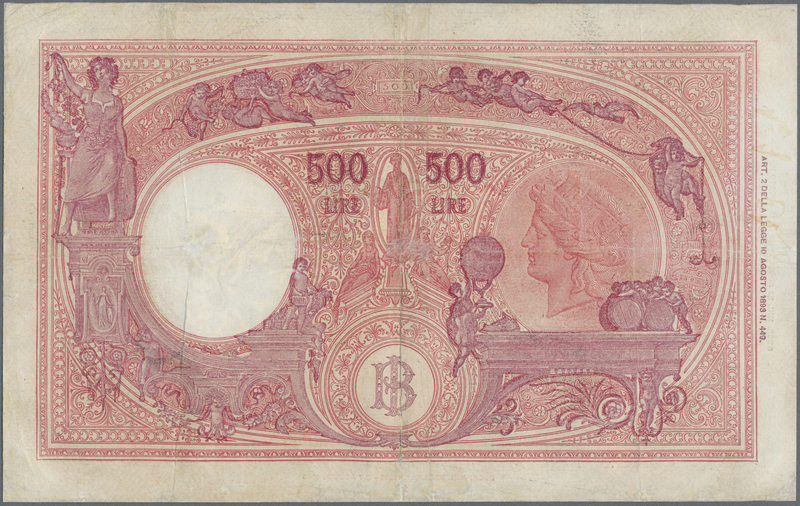 1840 Pick 85b 5000 Lire 1949 P. 85b, very nice condition note with crisp paper, bright original colors, no holes or tears, only a light center fold and very light handling in paper, stunning condition for this large size type of note that usually comes with several creases, folds and tears. 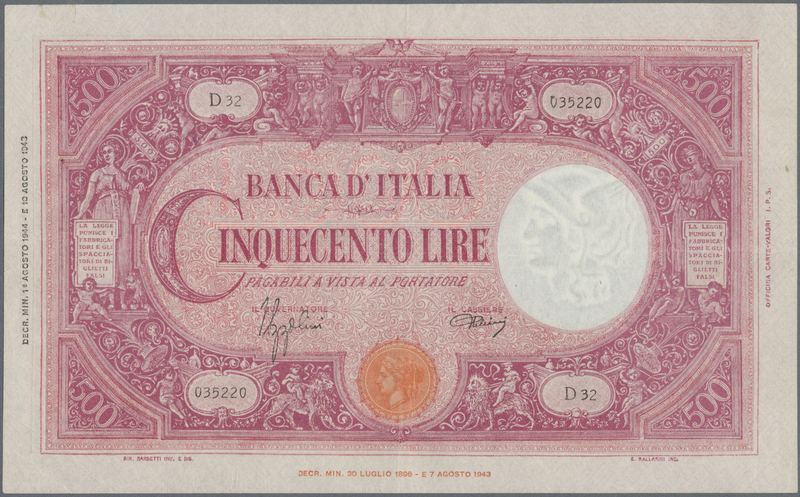 This example in condition: XF+. 1848 Pick 88 1000 Lire 1961 P. 83, crisp original paper, not washed or pressed, no holes or tears, light center bend, handling in paper, condition: XF. 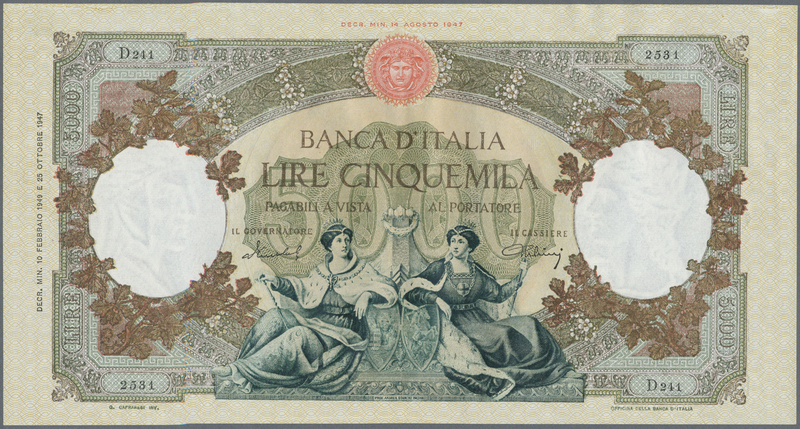 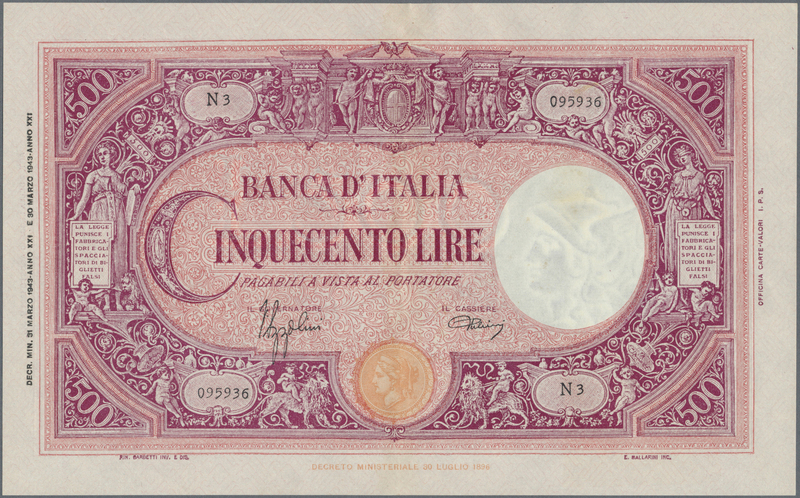 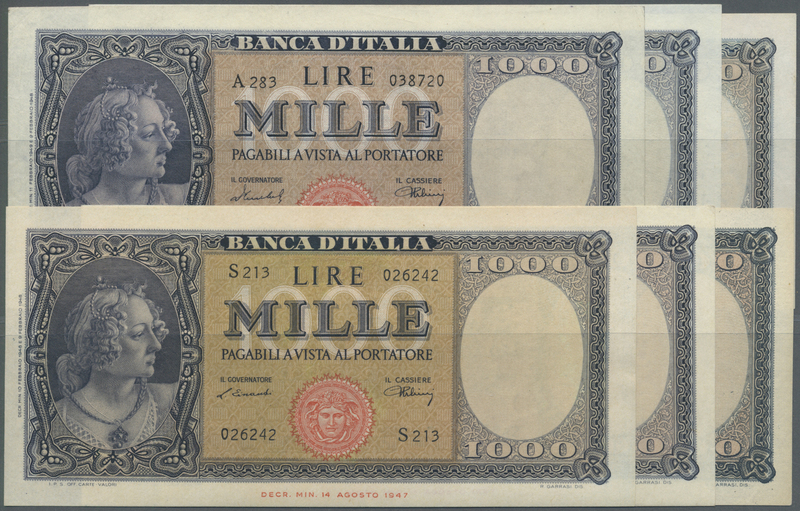 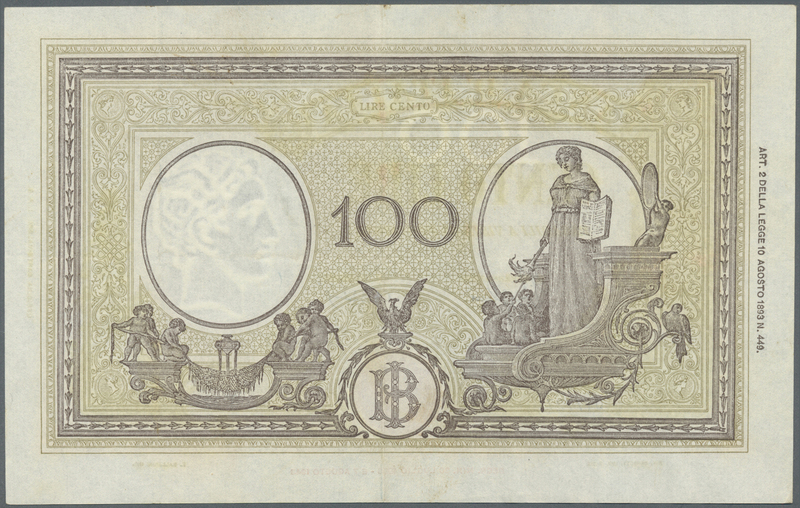 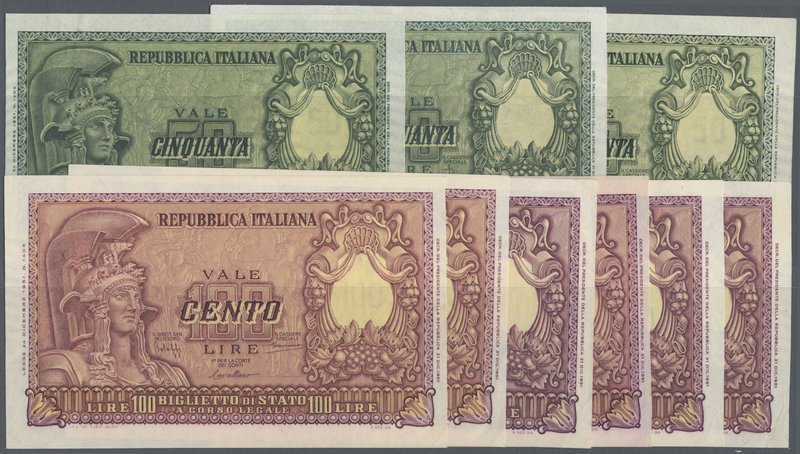 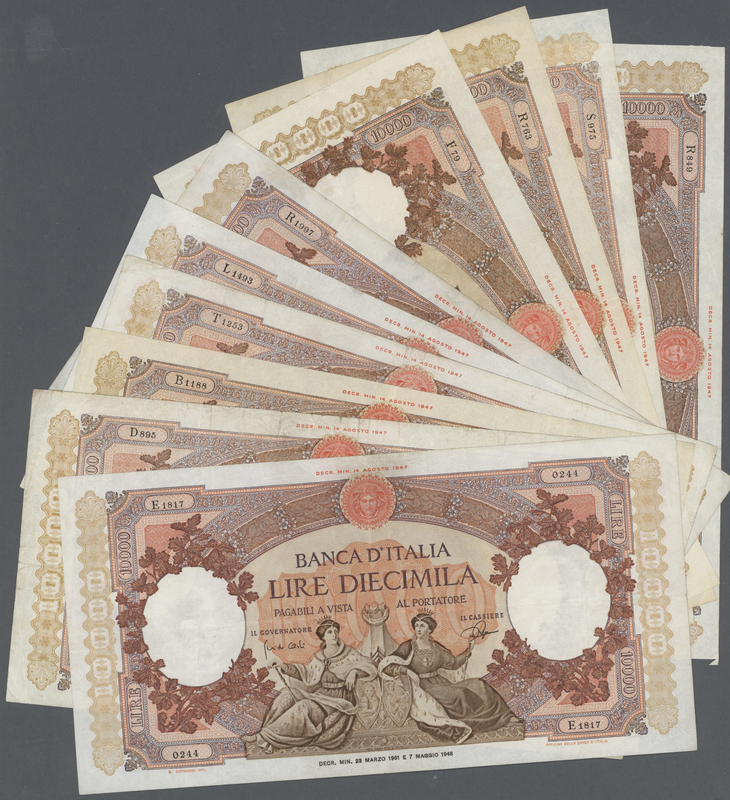 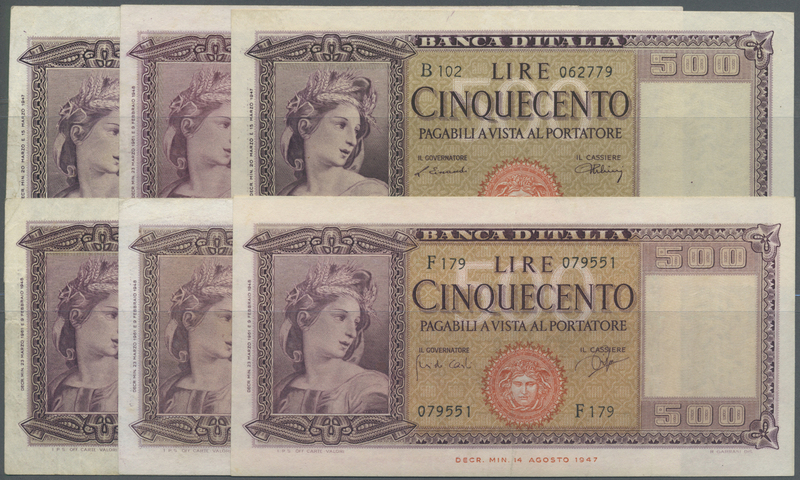 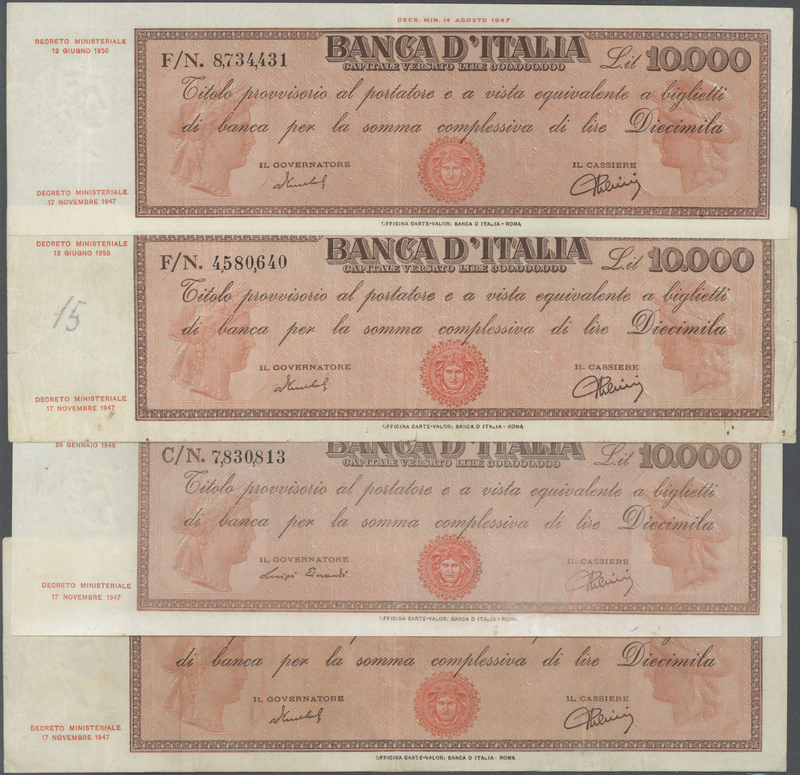 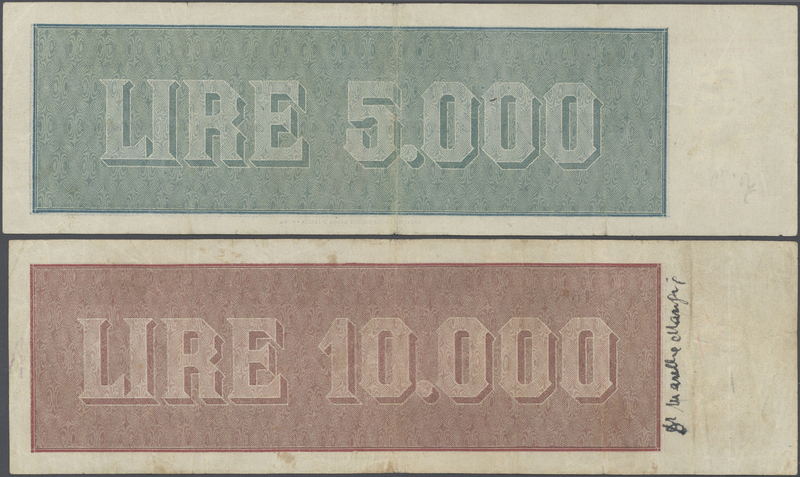 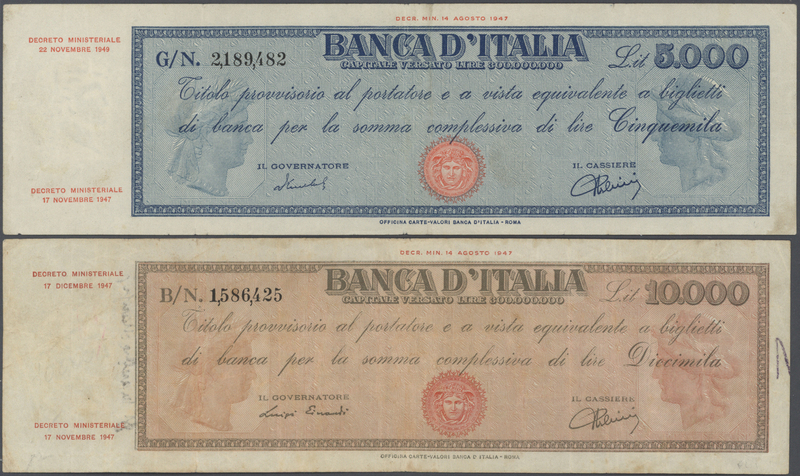 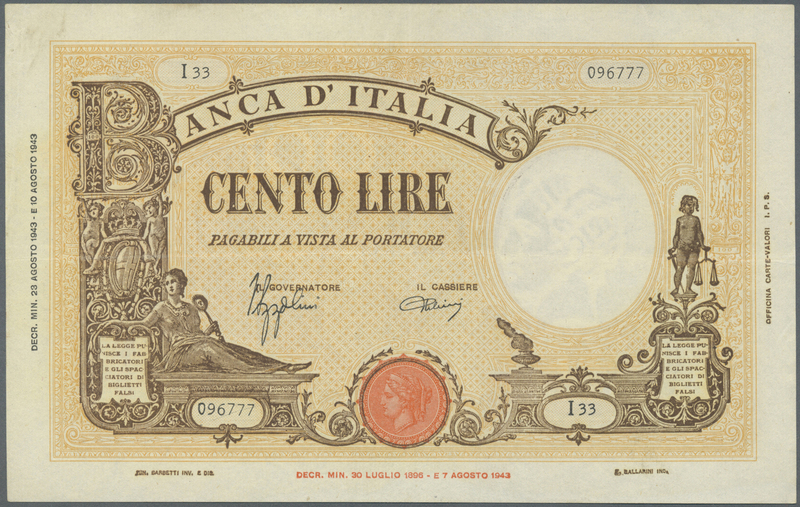 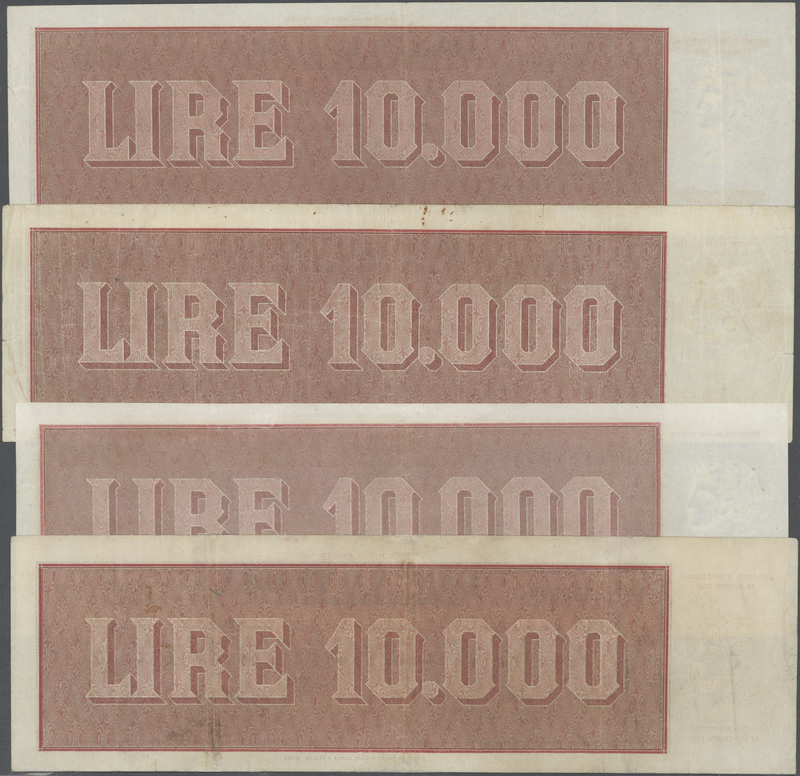 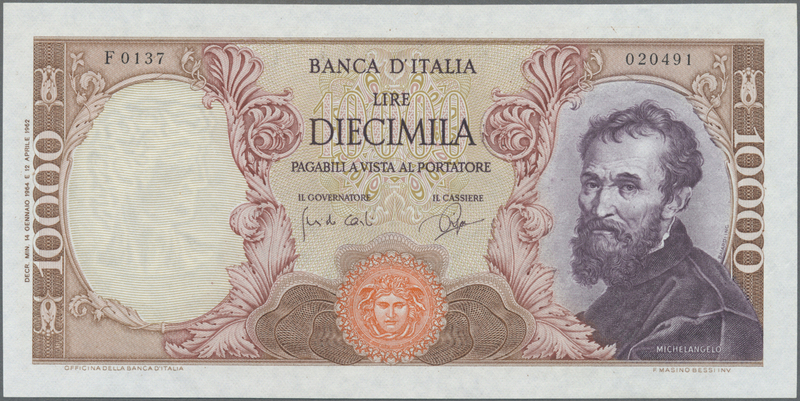 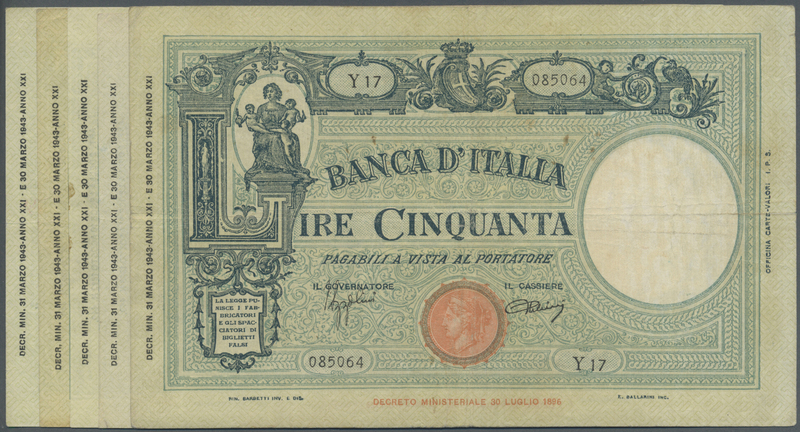 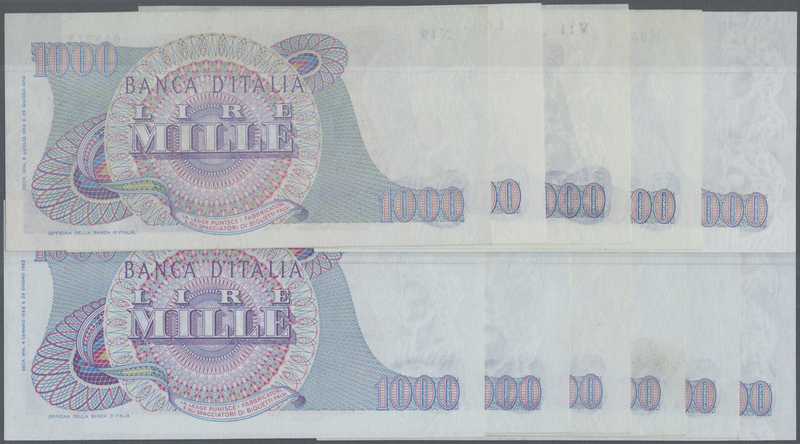 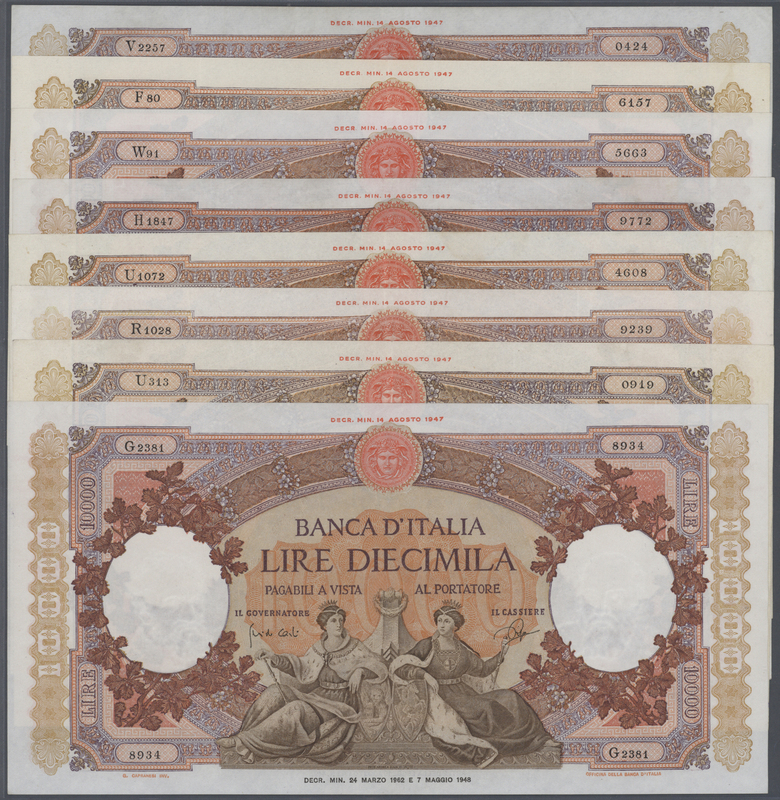 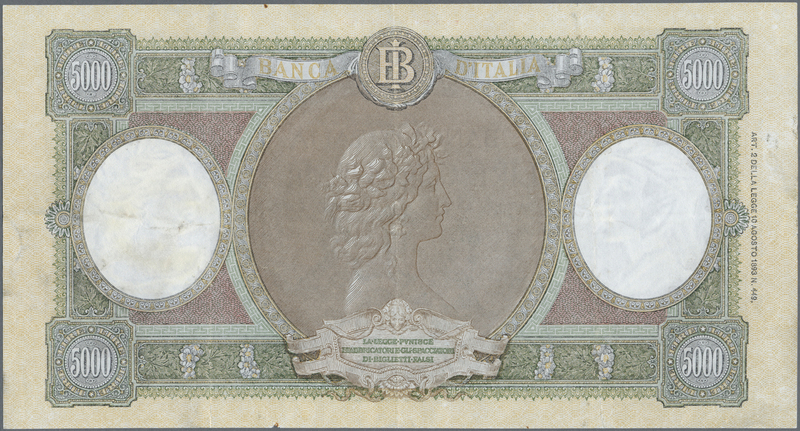 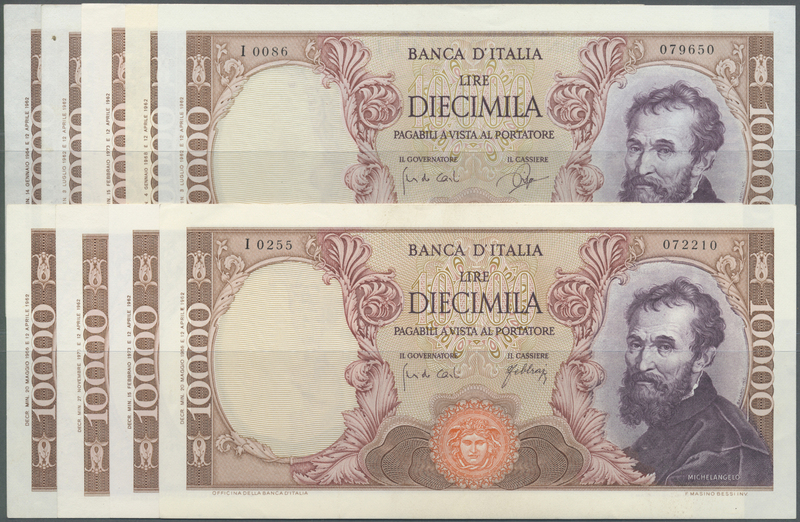 1849 Pick 88 1000 Lire 1961 P. 83, crisp original paper, no holes or tears, handling in paper, original colors, condition: XF. 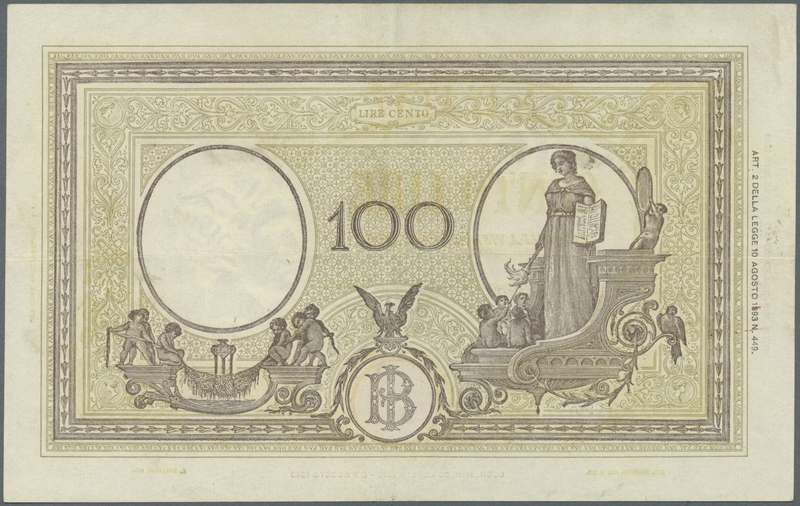 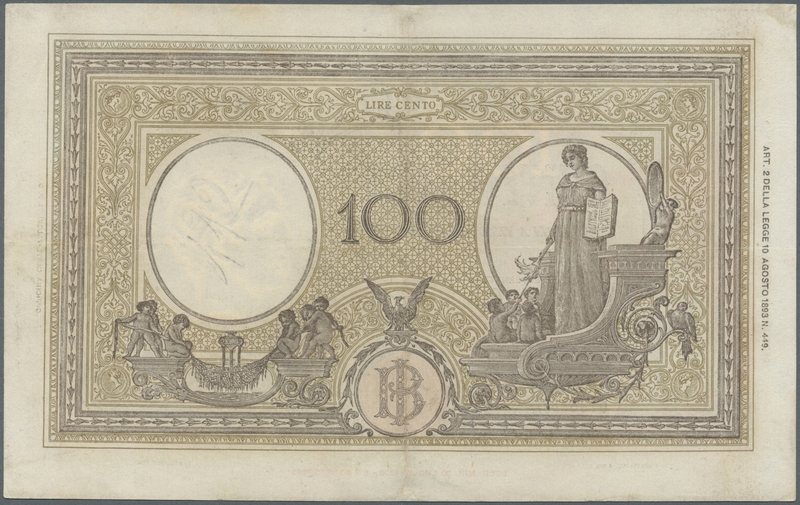 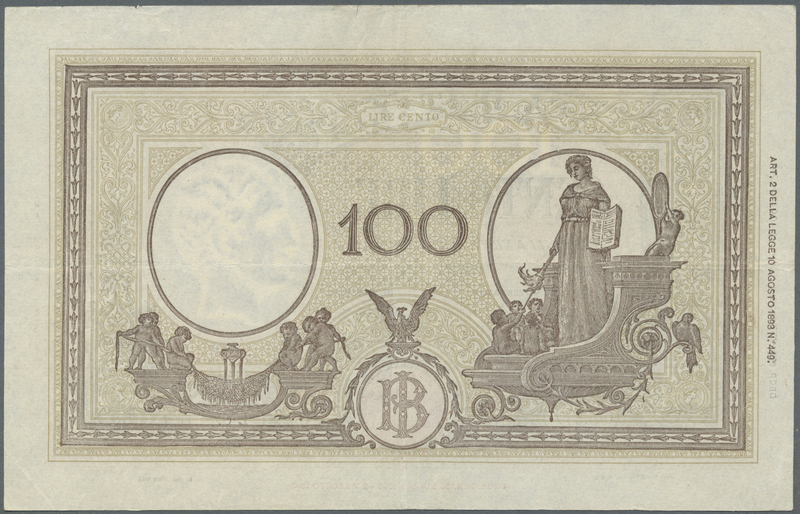 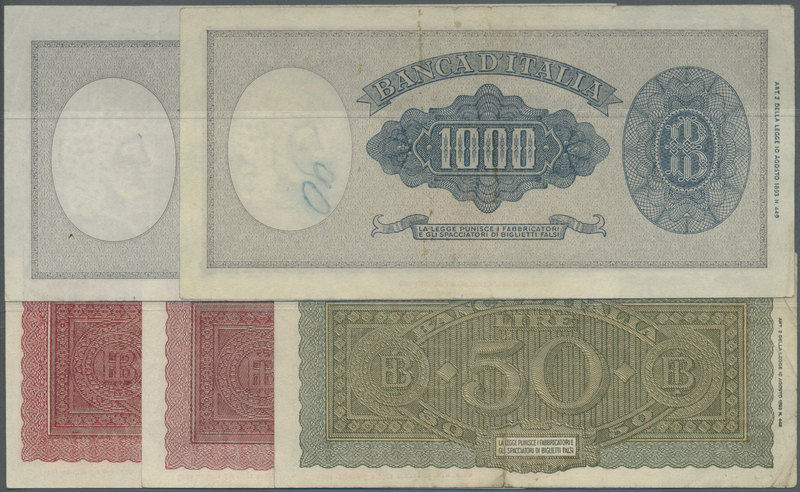 1853 Pick 89c 10.000 Lire 1957 P. 89c, large size note with beautiful design, pressed but still strong paper with crispness, original colors, no holes or tears, condition: pressed XF. 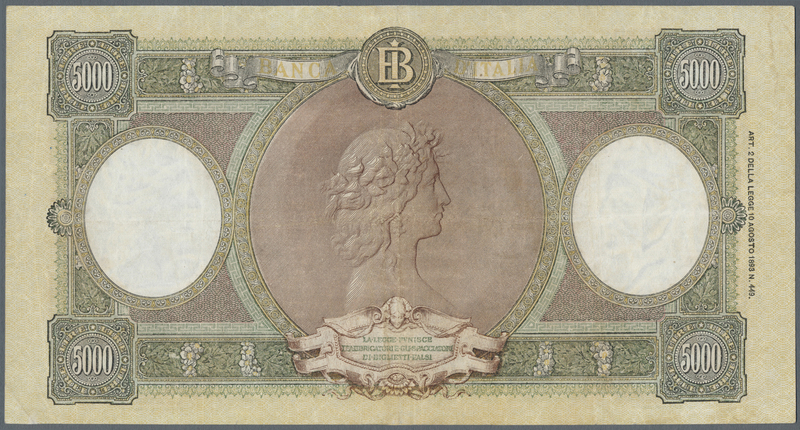 1854 Pick 89c 10.000 Lire 1958 P. 89c, large size note with beautiful design, pressed but still strong paper with crispness, original colors, no holes or tears, condition: pressed VF to XF. 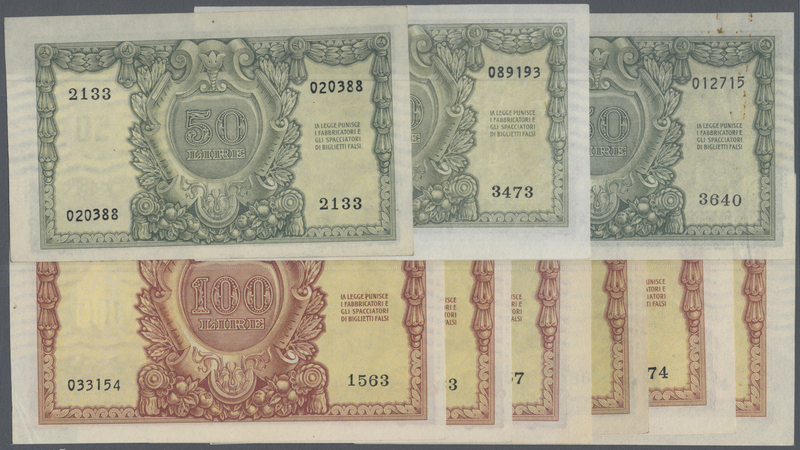 1857 Pick 94s 500 Lire 1974 Specimen P. 94s, in condition: PMG graded 64 Choice UNC EPQ. 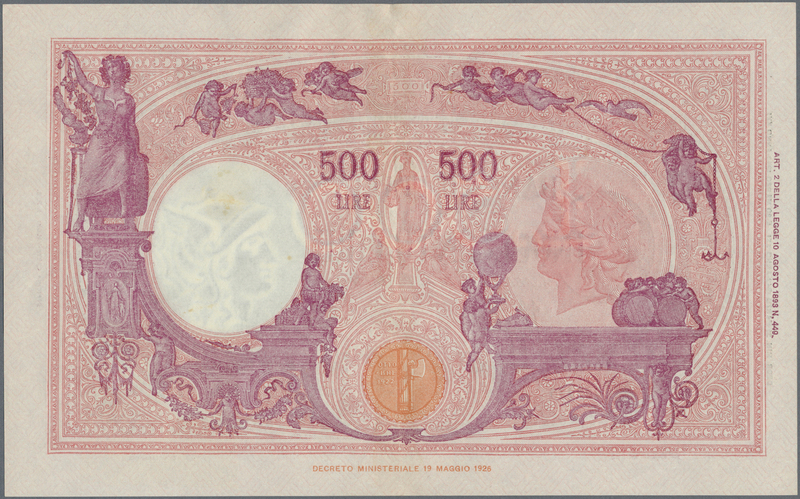 1859 Pick 96 10.000 Lire 1964 P. 96, crisp original, not washed or pressed, no holes or tears, original colors, conditoin: aUNC. 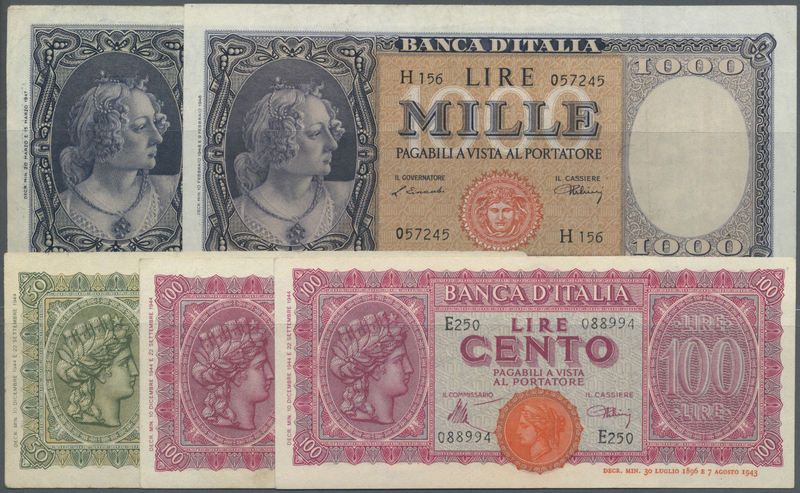 1860 Pick 96e replacement 1000 Lire 1968 Replacement letter "X" P. 96e, pressed but still very strong paper and original colors, no holes or tears, condition: pressed XF to XF+. 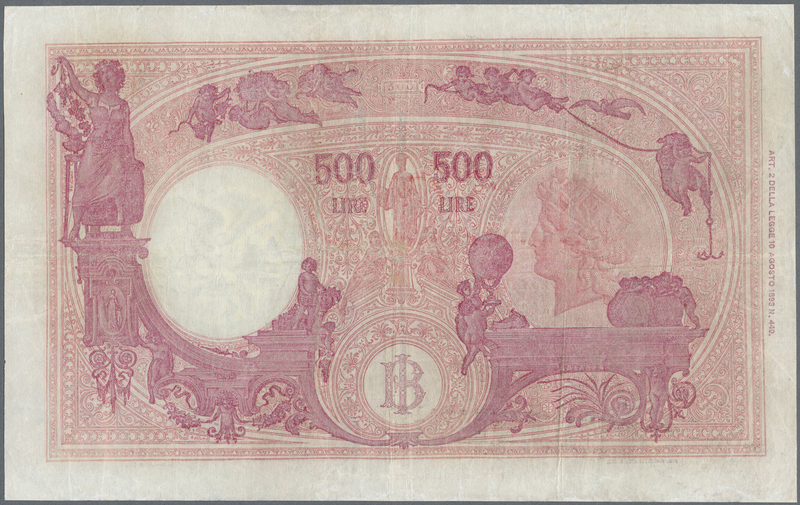 1862 Pick 98b 5000 Lire 1968 P. 98b with light and hard to see center bend, no folds, no holes or tears, strong paper and original colors, condition: aUNC. 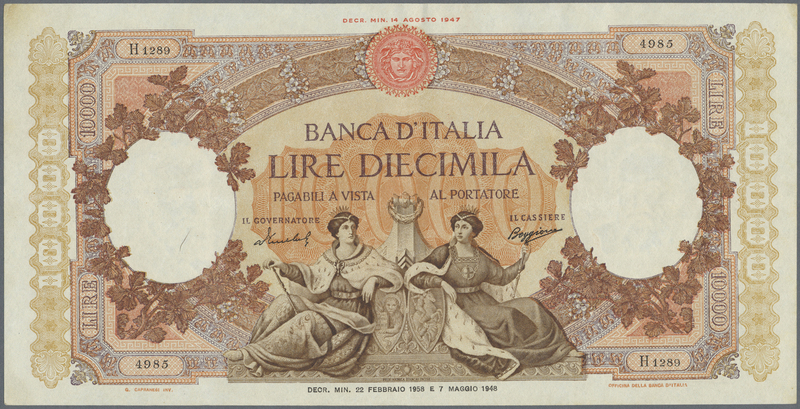 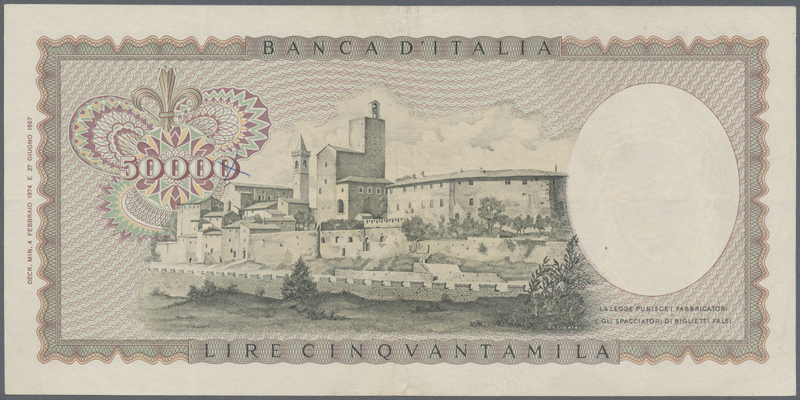 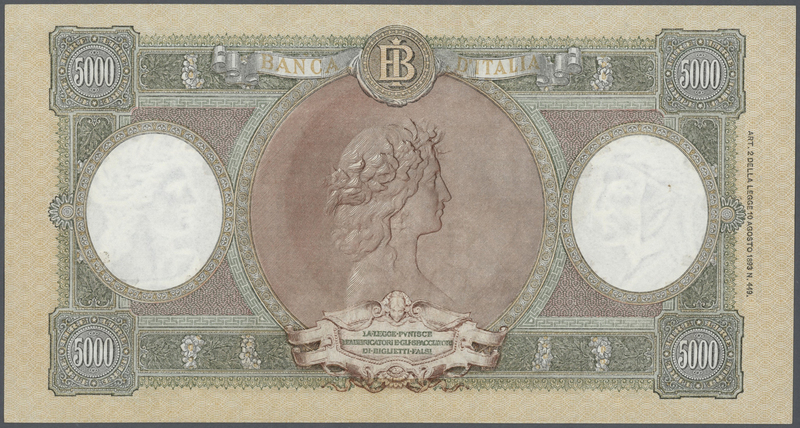 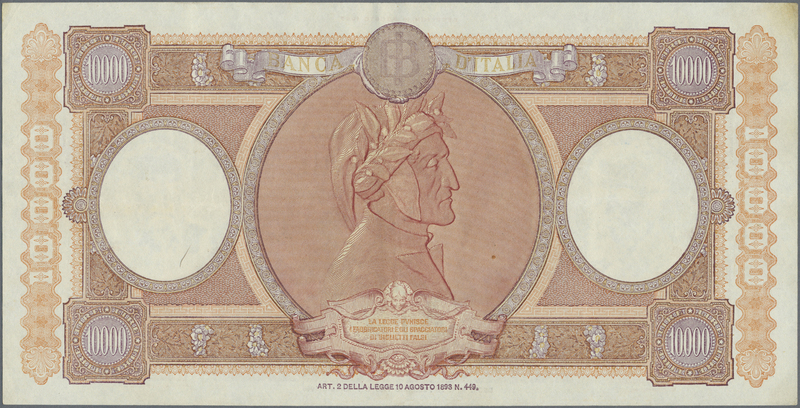 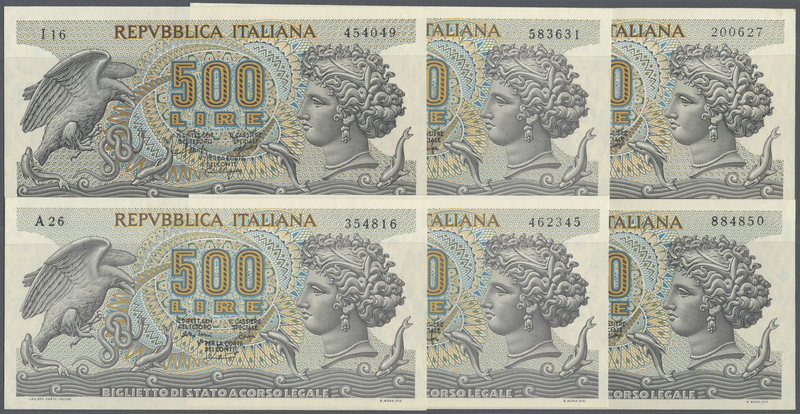 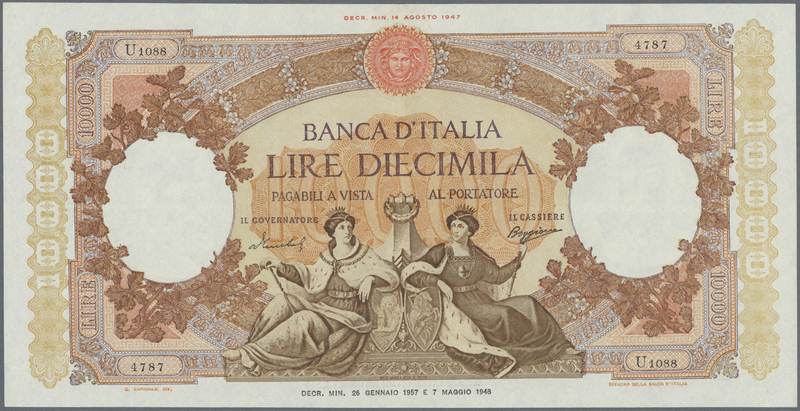 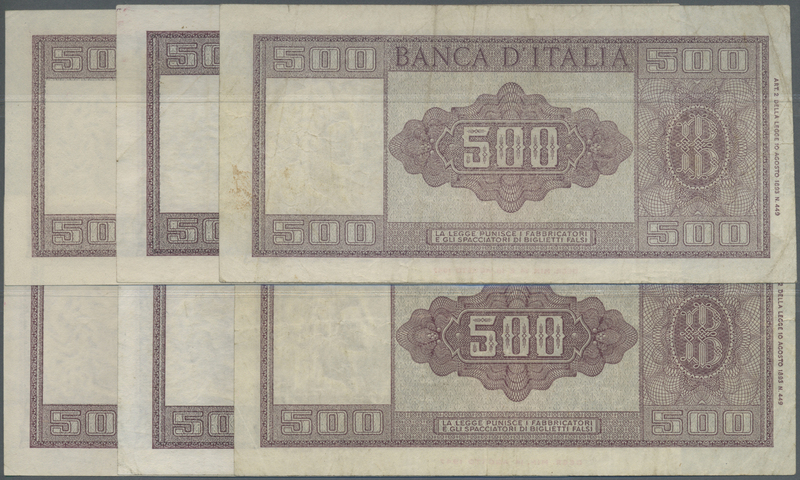 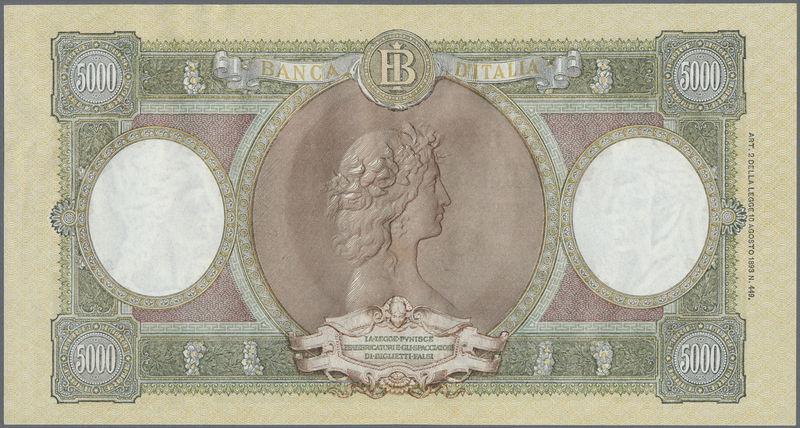 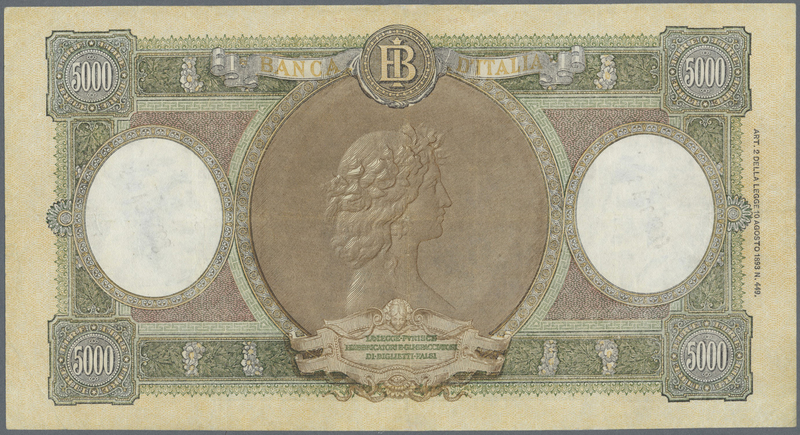 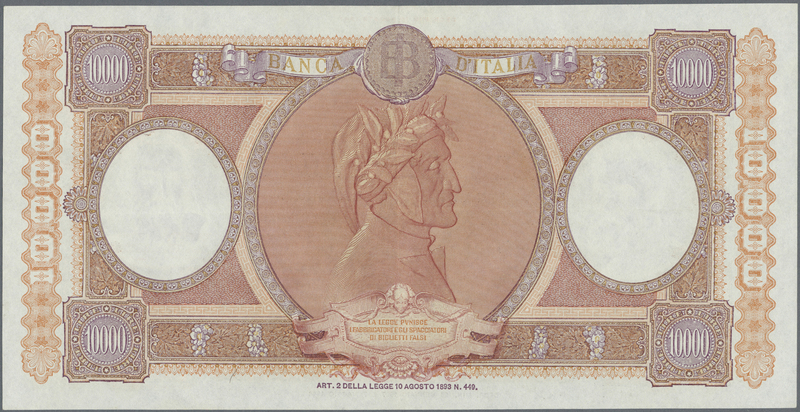 1863 Pick 99a 50.000 Lire 1967 P. 99a Leonardo da Vinci, S/N #V035658B, used with folds and creases, border tears, pinholes, but still strongness in paper and nice colors, condition: F- to F.
1864 Pick 99a 50.000 Lire 1967 P. 99a Leonardo da Vinci, S/N #P092047G, used with light folds in paper, pressed, several small border tears professionally restored, no holes, still strongness in paper and nice original colors, condition: F to F+, optically appears VF+ or better. 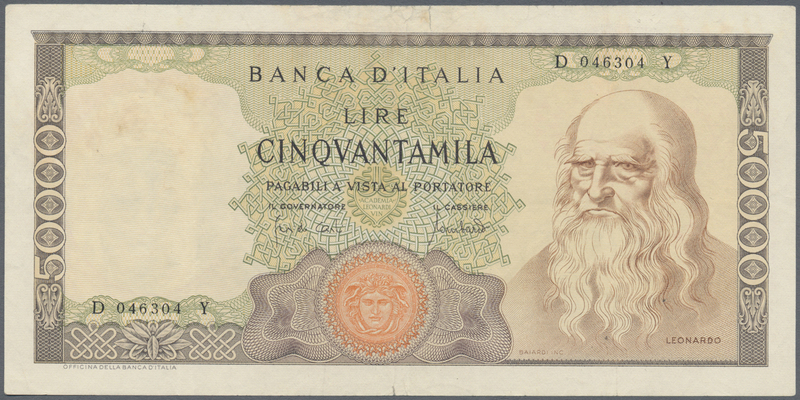 1865 Pick 99b 50.000 Lire 1970 P. 99b Leonardo da Vinci, S/N #P034903M, pressed, used with some light vertical folds in paper, borders show more wear with several small border tears, no repairs, no holes, still pretty strong paper and original colors, condition: F.
1866 Pick 99b 50.000 Lire 1970 P. 99b Leonardo da Vinci, S/N #D046304Y, used with some light vertical folds in paper, pressed, not washed, minor border tears, no holes, still original strongness and original colors in paper, condition: VF- to VF. 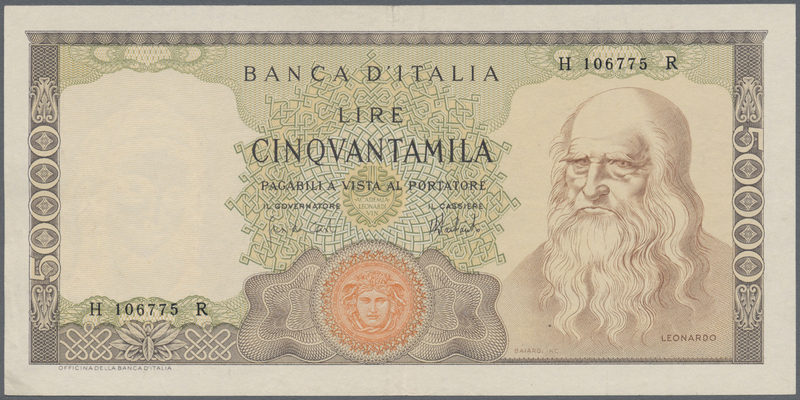 1867 Pick 99c 50.000 Lire 1974 P. 99c Leonardo da Vinci, S/N #H106775r, used with some light vertical folds in paper, one 5mm border tear at upper border, no holes, crispness in paper, original colors, condition: XF-. 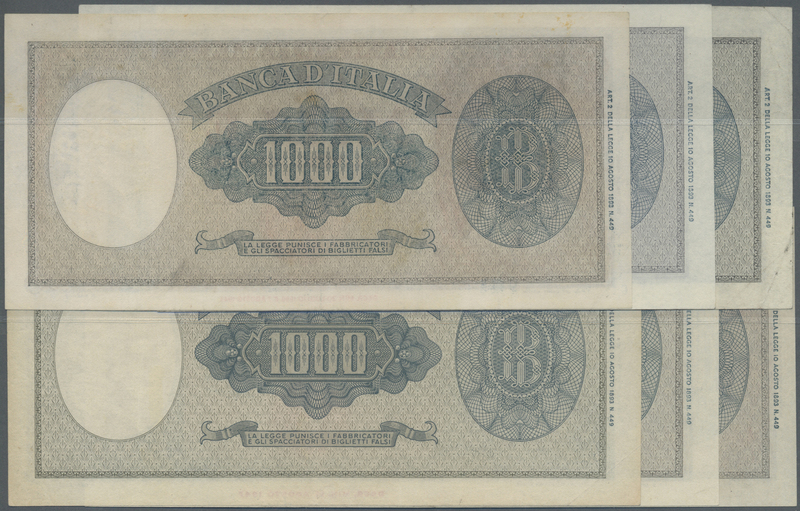 1868 Pick 100a 100.000 Lire 1967 P. 100a Manzoni, S/N B003488C, washed and pressed, minor border tears, lightly repaired, no holes, still strongness in paper and nice colors, condition: F+ to VF-. 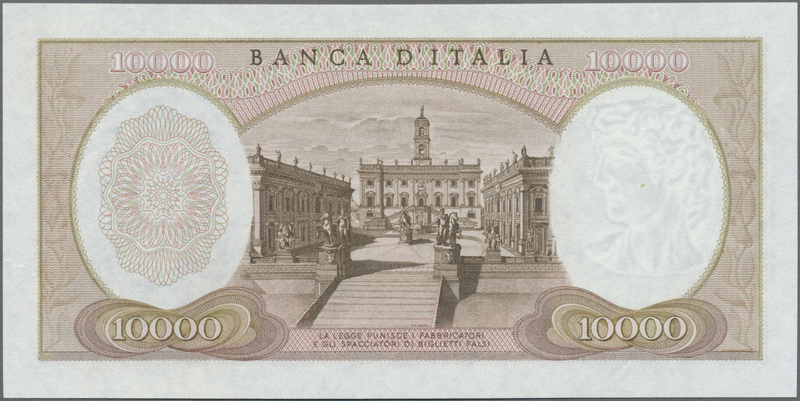 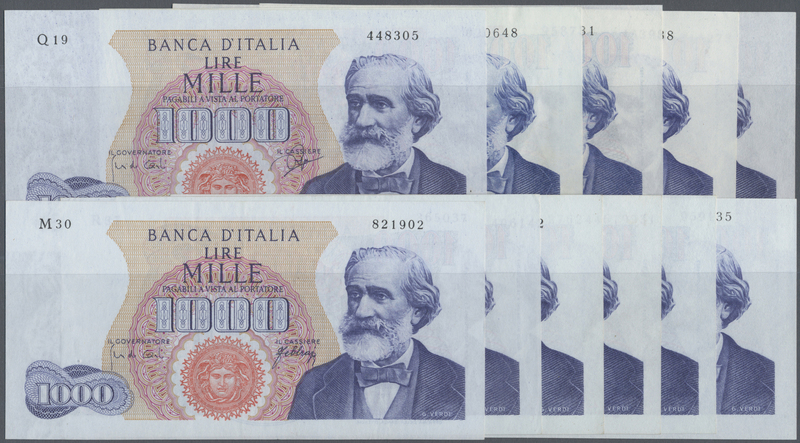 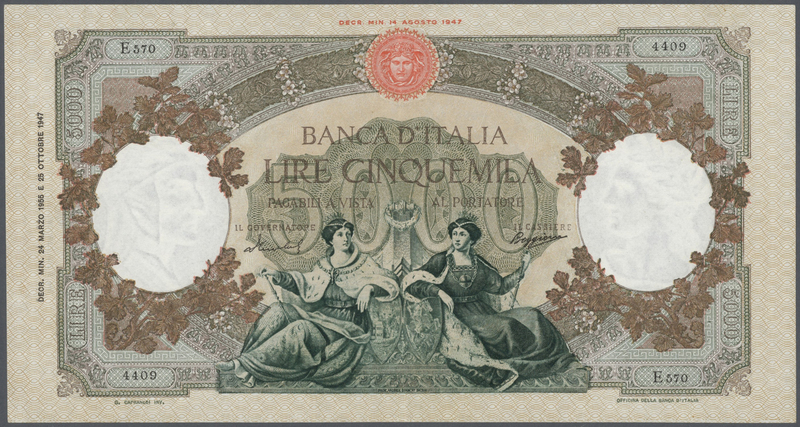 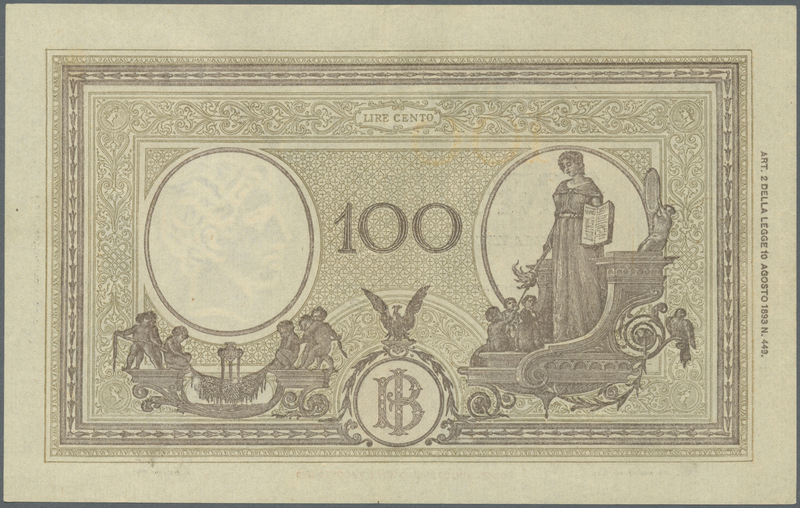 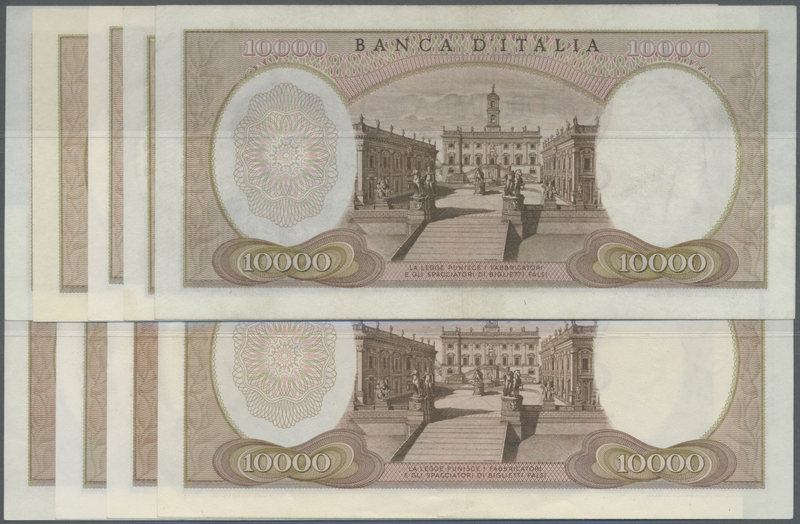 1869 Pick 100b 100.000 Lire 1970 P. 100b Manzoni, S/N Z059671Z, several folds in paper, pressed, restored at upper and lower border where the center fold ends, repaired small border tear, no holes, still strongness in paper and nice colors, condition: F.